The 2012 Tucson differentiates itself in the hotly contested small SUV category with its sleek styling, a host of standard features and Hyundai's famous warranty. The value-packed Tucson gets its motivation from a standard 2.0-liter 4-cylinder or a more powerful -and equally fuel efficient - 176-horsepower inline-4. Control to move in traffic and feeling of safety. I love driving my Hyundai Tucson. As a crossover, the size is perfect, not as small as a sedan and not as large as an SUV. The trunk height is perfect, since I can just position my items straight into the trunk. The seat backs move forward so I have been able to fit a large amount of things into the car, including long poles, Christmas tree, skis, and some oddly shaped items. I feel very safe in the Tucson. It is very sturdy, never wavers, and drives consistently. I do not have engine problems, but I maintain my car well at my Hyundai service station. The gas and brake pedals are consistent and work smoothly. The seats can be positioned perfectly for my back. I am able to keep the car clean on the inside. It has just the right amount of pockets and the glove compartment fits what I need. I use the center front container between the seats all the time. I put in one of those purse organizers and everything is accessible right away. The dashboard is very clear and has never made me confused. I use the Bluetooth connection and the buttons on the steering wheel all the time - mute, volume control, Audio instructions. I do not have to turn off my headlights when I get out of the car, since it automatically turns off when I click to lock the car. This way I never forget to turn on the headlights in bad weather or at night. I can easily control the speed of the windshield wipers, speeding it up a little or slowing it down a little, as the weather changes. In the wind, the car feels sturdy. 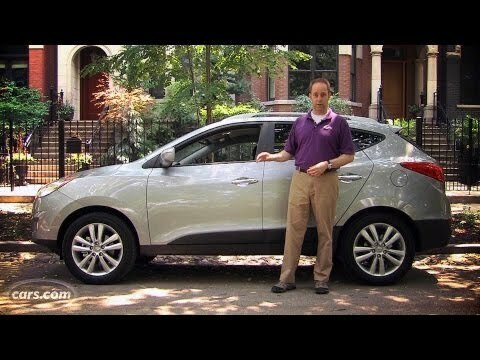 My Hyundai Tucson is both a good car and a bad car. The radio does not get reception most of the time. The seats get really static, the car at times felt like it didn't want to accelerate. I would sputter at times. The bumper bent due to how hot it was during summer. During winter it got really muddy and the mud started to discolor the bumper. I really like the light silver color of my car. The light color helps keep the inside from attracting the sun heat too much. The wheel also seems to lock a lot. I have to constantly fight with the wheel in order to unlock it the heater is really good and when I turn it on in the cold to warm it up, it does not take very long to warm up. While warm it up the fabric in the seats to warm up as well. I love how the back seats fold up to make room in the back when I need lots of space. I also really like how the gas switch is on the inside by my foot so I do not have to worry about someone stealing my gas. It's nice to have that little bit of security. I also love that it has a child lock and a window lock so I do not have to worry about my kid opening the door or window while I am driving. The rooftop window is my favorite part of the car. The rooftop window is tinted as well. The Tucson is beautiful blue which I get any compliments for. The car drives very smoothly and has good turning radius. There are some blind spots which makes it a little difficult when backing up or merging. The seats are cloth and surrounded by about 4 inches of leather which is difficult for me as I am vegan. I bought the car from a cousin and did not know. I have covered the driver's seat and steering wheel. The seats are comfortable for my back. I have had the car 2 1/2 years without any problems. .
Hyundai will notify owners, and dealers will inspect and tighten the bolts that secure the driver's air bag assembly, free of charge. The recall is expected to begin by the end of June 2014. Owners may contact Hyundai customer service at 1-800-633-5151. Hyundai's number for this recall is 118. The remedy for this recall is still under development. Hyundai will send owners an interim letter informing them of the issue beginning March 29, 2019. A second notification will be sent when the remedy is available. Owners may contact Hyundai customer service at 1-855-371-9460. Hyundai's number for this recall is 181.